Located in the historic SoHo neighborhood, the Leica Store New York is at the heart of New York’s creative pulse. The neighborhood of Warhol, Basquiat, and Haring has long been the home of the biggest figures in the world of Photography. In that spirit, the Leica Store often champions the work of local photographers in our Gallery, showing both established and new artists. Our full retail space is staffed by knowledgeable personnel with decades of experience at shooting, selling, and handling cameras. With long roots in the history of Leica products and practices, the Leica Store New York SoHo is a must visit location for local or visiting shutterbugs looking for a little photography advice, or for a hands on experience with all new Leica gear. Visit often to check on our ever-rotating case of used and collectible equipment, fashionable accessories, and our collection of photo books. 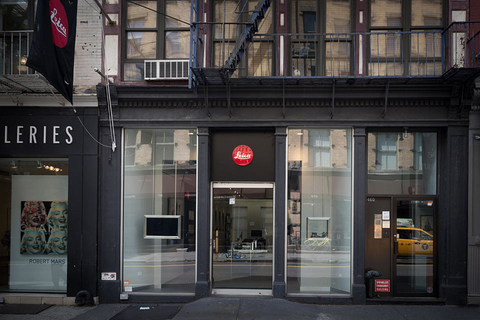 Whether you’re in the market for a camera, want to admire great art, or are attending a Leica Akadamie workshop, the Leica Store New York SoHo is the perfect destination for all photographers.